muneeba hassan wrote: Female Education in pakistan. how we improve the education in pakistan for female? how education is considered as the cheapest defence of a nation? A variety of research studies have point out the psycho-social problems of the students, teachers, planners and managers working in the public and private sector of education in Pakistan. These problems can be studied under in three domains i.e. home-centered problems, community-centered problems and school-centered problems. Though, the Quaid-e-Azam, Muhammad Ali Jinnah, in his message delivered in the first Education Meeting 1947, categorically stressed on taking practical steps in reshaping the whole education system of the country, yet the situation regarding the education sector of Pakistan has been very uncertain and critical till yet. The commissions and policies till the recent years have beautifully worked out various strategies and plans for enhancing and changing the set of courses, giving quality education, preparing standard textbooks, resolving the problem of medium of instruction, streamlining the planning and management of the institutions, but due to the policies and reforms without implementation, the mismatch in public and private systems, the teaching of languages only and the polarization and existence of pressure groups have weakened not only the whole education system of Pakistan but the other institutions and organizations also. Furthermore, it is a fact that the attitudes of teacher, the response of student and the behavior of manager do have a crucial role in making the personality of the individuals and social progress, but in addition to this some physical problems that still exist here are the overcrowded classrooms, insufficient teaching materials, poor staffing, absence of equipped libraries and laboratories, and lack of physical facilities like playgrounds, drinking water, washrooms, recreational, common, medical and retiring rooms and furniture etc. This alarming situation has caused an awkward backwardness of the education system in the country. Furthermore, besides the system problems as observed, it is obvious that the teachers' problems of insecurity, accommodation, remuneration, political exploitation life threats and deprivation prevent a teacher to play the role of an implementer, prompter, director, guide, counselor, manager, organizer and instructor inside the school and also halt him/her to work outside in the society as a good social. Unluckily, due to the lack of professional growth and leadership, teacher in Pakistan evidently faces a hurdle in the way toward lifelong and quality education. Most of the teachers are virtually literate and have regressive trends. However, the one room affair, the schools without boundary walls and the negligible participation of community also deteriorate the smooth process of education in Pakistan. The out of order homes, the social status of parents, poverty, orphanage, divorced families, crowded homes, sibling rivalry problem, family educational background, inferiority complexes, harsh discipline and child labour are also persistently showing their virulent fangs to tear down the learners in our country. Education in Pakistan is divided into five levels: primary (grades one through five); middle (grades six through eight); high (grades nine and ten, leading to the Secondary School Certificate); intermediate (grades eleven and twelve, leading to a Higher Secondary School Certificate); and university programs leading to graduate (undergraduate) and advanced (post-graduate) degrees. A child may begin his/her schooling at a pre-school at the age of 3. Over the last few years, many new kindergarten (sometimes called montessori) schools have sprung up in Pakistan. 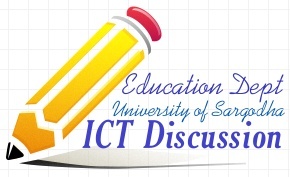 ICT brings a change in education in pakistan. All of you are doing good but i need some more from you people... like creating your own phrases and concepts in discussions.. some have not understood todays discussion and it was all about education system in Pakistan.. According to the OECD's 2009 Global Education Digest, 6.3% of Pakistanis (8.9% of males and 3.5% of females) were university graduates as of 2007. Pakistan plans to increase this figure to 10% by 2015 and subsequently to 15% by 2020. There is also a great deal of variety between the different age cohorts. Less than 6% of those in the age cohort 55-64 have a degree, compared to 8% in the 45-54 age cohort, 11% in the 35-44 age cohort and 16% in the age cohort 25-34. After earning their HSC, students may study in a professional college for Bachelor's degree courses such as engineering (B.Engg), medicine (MBBS), dentistry (BDS), veterinary medicine (DVM), law (LLB), architecture (B.Arch) and nursing (B.Nurs). These courses require four or five years of study. Students can also attend a university for Bachelor of Arts (BA), Bachelor of Science (BSc), Bachelor of Commerce (BCom) or Bachelor of Business Administration (BBA) degree courses. There are two types of Bachelor courses in Pakistan: Pass or Honours. Pass degree requires two years of study and students normally read three optional subjects (such as Chemistry or Economics) in addition to almost equal number of compulsory subjects (such as English and Pakistan Studies). Honours degree requires three or four years of study, and students normally specialize in a chosen field of study, such as Biochemistry (BSc Hons. Biochemistry). It can be noted that Pass Bachelors is now slowly being phased out for Honours throughout the country. Many Master's degree programs only require one and a half years of study. Doctor of Philosophy (PhD) education is also available in selected areas and is usually pursued after earning an Master's degree. Students pursuing PhD degrees must choose a specific field and a university that is doing research work in that field. PhD education in Pakistan requires at least 3–5 years of study. What do u mean by the lower level ?? Miss Sehrish Naseer ?? What do u mean by education in pakistan increasing ?? day by day ?? justify your post please !! What change does ICT bring ? in this particular region ?? i dont think, that ICT has brought any changes in the educational system of Pakistan ..... !